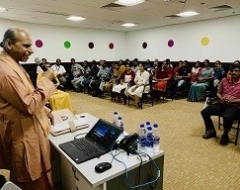 The celebrations of the 124th Birth Anniversary of Sri Sri Paramahansa Yogananda (1893-1952), author of the spiritual classic “ Autobiography of a Yogi”, and the centenary of the Yogoda Satsanga Society of India (YSS) took place on 5th Jan in Chennai. A capacity audience of 300 attended the event at a hall in T. Nagar. YSS monastic Swami Omkarananda Giri presided over the function. He began with a short slide introduction on the life history of Paramahansa Yogananda, including founding YSS and his world mission. Paramahansa Yogananda had founded YSS in 1917, in a humble hut in Dihika, West Bengal. Today it has grown to a worldwide organization with thriving monastic communities and vibrant worldwide network of practitioners of Yogananda’s teachings. 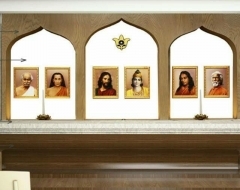 In India alone, YSS has over 200 meditation centers and 4 ashrams. 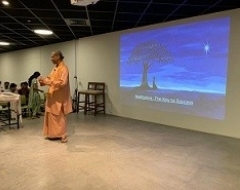 Swamiji then gave an inspiring talk on ‘Kriya Yoga – An ancient science for the modern age’, which explained that exists a higher reality beyond the world of the senses, if we but know how to tune into it. Our ordinary consciousness, which is engrossed with the world of matter, lends it a seeming realness. However, this higher reality of God as the Self can be experienced through practice of scientific techniques of meditation. 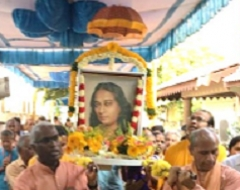 He said Yogananda brought to the world various techniques; such as those for recharging the body battery with Cosmic life force, to calm the restless breath and mind, to expand one’s consciousness by Kriya Yoga. Kriya Yoga, he mentioned, is an ancient science of calming the sensory tumult of the lungs and heart (amongst other benefits) to enable the practitioner to experience the transcendental reality. This technique is also referred to Bhagavan Krishna in the Bhagavad Gita and came from India’s higher age. Swamiji then stressed the need to make time for meditation all the while performing our duties and obligations in the world. By making time to meditate and feeling God’s infinite succor, one feels confident and enthusiastic to deal with life’s experiences and thereby live to one’s fullest potential. A guided meditation followed the talk in which Swamiji explained simple methods to calm the restless breath and mind. He then led a specific service with the audience to pray for their loved ones and world brotherhood. The audience participated enthusiastically and several members of the public mentioned they felt the beneficial after effects of the meditation and prayers. Those wanting to learn more about Kriya yoga and balanced spiritual living may visit the YSS website: www.yssofindia.org. YSS has a meditation center and bookstore in Chennai at Omkar Apartments, 14, Rajarathinam Street, Kilpauk. Contact: 044-2643 1141.